Blackwater Ophelia is inspired by the 1852 painting Ophelia by John Everett Millais, and by a visit Hannah made to the Aamjiwnaang First Nation community in Lambton County, in 2010. While working in the community from 2010 to 2012, Adad Hannah produced two major works, The Diversions, one of the gallery's inaugural exhibitions, and Blackwater Ophelia, both of which are now in the JNAAG permanent collection. The artist worked with the collaborative support of local artists Jessica Butler, Norman Barney, Jane Austin and his assistant Russell Bonin. Local photographer Hailey McHarg is featured as Ophelia. "I have liked this painting for a long time; it is so lush and melancholic. It also depicts nature, but nature as seen in the middle of the nineteenth century, a nature laying itself out for the photographic—which is really a nature constructed by and for photography. To restage this scene for photography, in a painstaking manner using silk flowers and a built set draws attention to the artifice of photographic images, while still seducing with the same techniques Millais used 150 years ago. This double reading/double presence is interesting for me, and hopefully for viewers as well." Ophelia is one of the most frequently illustrated of Shakespeare's heroines and one of the least discussed in Shakespearean critical texts. It is the mythology of Ophelia that has captured and sustained the interest of artists, poets, psychoanalysts, film makers, fashion designers, writers, feminists, photographers, educators, and musicians for over 400 years. Having been rejected by Hamlet, Ophelia's last breath is about to escape through her lips as her entire being gives in to heartbreak. Her physical body is held for a saturated and poignant moment by the buoyancy of the still water. Her long sinewy hair, floating just below the surface of the water, mirrors the tangled willow branches above her head as she begins her slow descent into the dark comfort of the water. Her voice will soon be silenced. 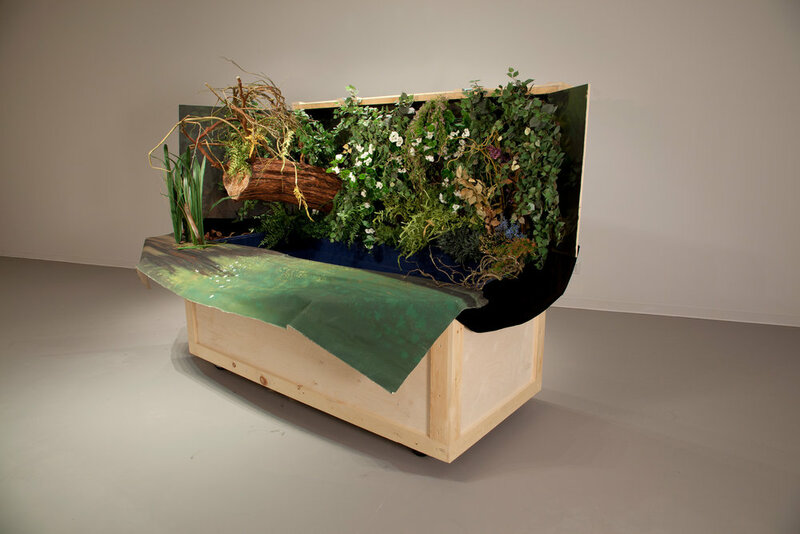 2013, Blackwater Ophelia, The Judith and Norman Alix Art Gallery, Sarnia, Ontario.